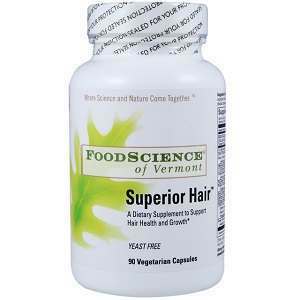 This review is for FoodScience of Vermont Superior Hair. This supplement is targeted to repair damaged hair. It also is meant to promote the growth of healthy hair. Please keep reading to see if this daily dietary supplement is the ideal one for you. 360 mg Saw Palmetto for the promotion of hormone balance. 75 mg Pygeum extract and 50 mg Stinging Nettle root to aid in hair follicle repair. 50 mg Diindolymethane or DIM is added since it is similar to human hormones even though it is a plant indole. It is stated by the manufacturer that this is their patented formula. 600 mcg Biotin and 15 mg Zinc to support and aid in hair growth. 200 mg MSM, 200 mg L-Cysteine, 500 mg DL-Methionine are all added to promote healthy hair and also softer skin. Other ingredients that are included are: vegetable cellulose, rice flour, vegetarian leucine, and soy. Those who are allergic to soy should not consider this as a daily dietary supplement. The manufacturer suggests a recommended serving of 3 tablets daily, preferably with a meal. They state that the dosages can be divided between the morning and evening. Due to the ingredients found in this product, it is stated as a warning that pregnant or nursing women should not take this supplement. Saw Palmetto can also induce a side effect of indigestion. This product is not sold directly from the manufacturer’s website. The link to the suggested retails offers a discounted price of $27.90. The original price of the product is $51.60. This price is for the 30 day supply, which is 90 tablets. It’s considered to be moderately priced compared to some of the other supplements that are on the market. There is no mention of a monthly renewal subscription on the manufacturer’s website but some of their authorized online retailers do offer the option for a monthly delivery. While the website does not directly sell to consumers, it states that all of its authorized sellers honor their customer satisfaction guarantee. Those who are not 100 percent happy with their results will be honored with a full refund. From the various authorized sellers, there are generally positive reviews about the product. Customers have stated that they have experienced results with this supplement. FoodScience of Vermont Superior Hair thoroughly lists out its ingredients on the manufacturer’s website and also the authorized sellers websites. The sellers are not just located within the United States, there are international online retailers as well. This makes the product accessible to the consumer if they are located outside the States. Due to the generally positive reviews, it seems that this product does provide substantial results. This is an ideal supplement for those who want to replace their current dietary supple and address the hair and skin condition. Perhaps one of the only issues is the price. It is higher priced than other hair and skin supplements on the market. A 30 day supply will run you close to $30.00 a month. John Brownstone	reviewed FoodScience of Vermont Superior Hair	on July 28th	 and gave it a rating of 3.5.